Longtime reader Phil Alexander was the person who originally sent us the tape of the bizarre Santo Gold infomercial, and he has recently uncovered two fascinating bits of info about Santo. This is the actual original Santo Golds Blood Circus Wrestling Movie 35 MM Film Reels. NEW. Asking price, Seven Hundred and Fifty Million. Includes insurance. You can buy a Partnership in it. All bids will be considered. That may seem like a lot of money, but you have to think of it as an investment. If you buy the rights to Blood Circus for $750 million, and sell DVDs at $25 a piece, then you have to sell only 30 million copies to break even! Here someone who claims to “have known The Rigatuso Family for over 60 years” seeks to set the record straight about Santo Gold. It starts out by claiming, “Santo Gold is a Living Legend since 1983. He is known and respected Worldwide by millions. His songs and performances have aired on National TV hundreds of thousands of times.” It then relates the various glories of the life and impact of Santo Gold. Hiring a CPA who had a nervous breakdown and lost his records (which were later found “in a bottom of a barrel”). Sending payment to the IRS but forgetting to including a Social Security number. Hiring employees who stole from him. According to Blood Circus’ Wikipedia page, the movie cost about $2 million. 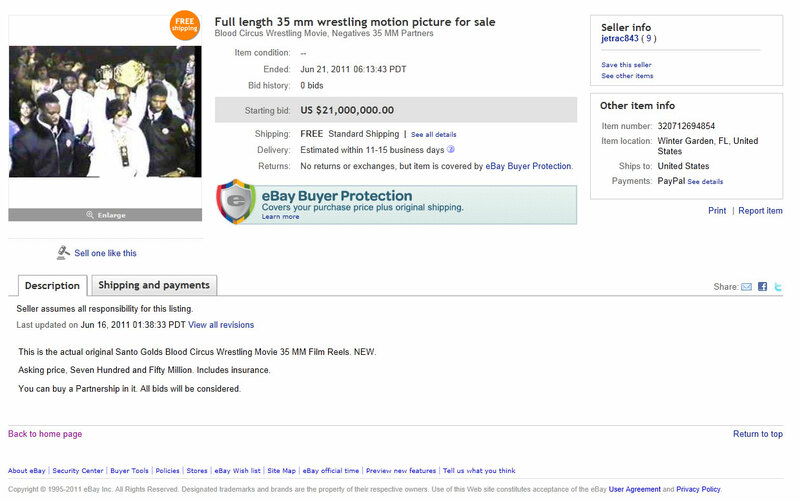 How Santo expects this movie could possibly be worth $21 million (much less $750 million or $1 billion) is beyond me.